When it comes to roadway traffic management, Roadway Construction Services (RCS) definitely qualifies as extraordinary. From our safety record to our competitive prices, we deliver on an unprecedented scale. Have we tapped into a mysterious force to raise our traffic management company well above the ordinary? Not at all. Our secret boils down to this – a carefully-balanced blend of dedication, experience, and expertise. This powerful blend drives every component of our traffic management services. It’s even evident in unexpected places. For instance, in the deployment of construction barricades. Many people figure this is just a matter of setting down a few orange barricades or placing a wall of K-Rail on a road. Not with Roadway Construction Services. This is intricate stuff demanding the utmost attention to every detail. When deploying construction barricades, we rely on dedication, experience, and expertise to uncover optimum solutions. Carefully examined along the way are variables such as road conditions and anticipated traffic flow. Only after we’ve analyzed the entire picture are we ready for action. When we set traffic management cones on the road, you can be sure they’re the right ones in the right place. For us, precision is the name of the game. Precision certainly takes precedence when we formulate a traffic management plan. Nothing haphazard about this crucial process. When our strategists take the reins, every contingency, condition, need, and objective is carefully digested and evaluated before a single decision is made. This meticulous attention to detail provides the raw material necessary to develop an air- tight traffic plan. Without this blueprint, effective roadway traffic management would be impossible. Once a solid traffic control plan is in place, our job is through, right? Wrong. We still must acquire city encroachment permits for lane closure. These authorizations require the approval of key municipal decision makers. Not exactly a cake walk. This group of leaders will want answers to a ‘million’ questions ranging from ‘which construction barricades will be implemented’ to ‘how many personnel will be required.’ A solid, comprehensive traffic management plan provides those answers. In addition to developing solid plans, we leverage many long-term relationships with decision-makers to expedite the permitting process. These relationships provide a fast-track to quick approvals, without the obstruction of red tape. By reaching the goal line quicker, we save clients considerable time and money. One other money-saving feature of Roadway Construction Service is our road traffic management rates. With customary efficiency, we manage to keep a lid on costs and pass the savings on to our clients. In the end, it’s a win-win for everyone. Would you like to learn how our roadway traffic management services can improve the safety and efficiency of your construction project? 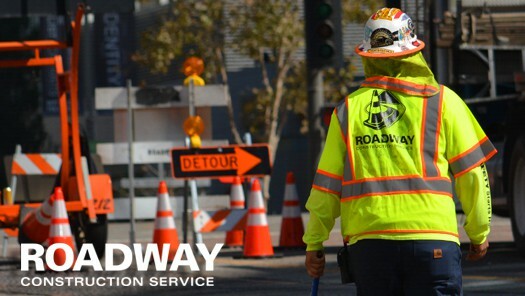 Reach out to Roadway Construction Service at (855) 907-7233 for more information about our industry-leading solutions and competitive traffic management rates.